The picturesque parish of Wells-next-the-Sea is situated on the North Norfolk coast, in between Holkham to the west and Warham to the east. The town itself is a small seaside resort and a working port. The name Wells is derived from the fact that it used to tap the springs of fresh water held by the underlying chalk on which it is built. People have lived in the area for a long time, and the parish was certainly long established by the time of the Norman Conquest, its population, land ownership and productive resources being extensively detailed in the Domesday Book of 1086. The earliest dateable evidence of human activity comes in the form of Lower Palaeolithic artefacts (NHER 1808) of unspecified type, reported to have been found in the 19th century. There as yet no Mesolithic finds, but Neolithic flint tools include polished axeheads (NHER 1809, 1813, 1812 and 39881), a flake (NHER 12572), fabricators and a knife (NHER 15325). A flint flake (NHER 21199) could be Neolithic or Bronze Age. The only definite Bronze Age objects are a few fragments of pottery (NHER 1814), probably pieces of cremation urns. An evaluation excavation in 2005 at Corner House revealed an Iron Age pit containing Iron Age pottery fragments, part of a quern, pieces of salt-making briquetage and flint artefacts (NHER 41754). These were important finds, not only because they are rare in themselves, but because they are the first evidence of Iron Age activity in Wells. Roman finds are relatively scarce at the moment, consisting of a coin hoard (NHER 1804), other coins (NHER 11538, 40782 and 42562) and pottery fragments (NHER 1849, 18176 and 42562). 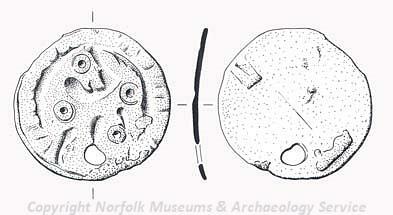 Saxon objects are pottery fragments (NHER 18176 and 42562) and a brooch (NHER 24668). 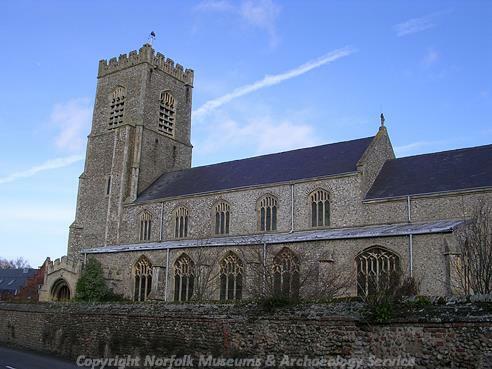 The oldest surviving building in the parish was St Nicholas’ Church (NHER 1851). Originally constructed in about 1200, it was rebuilt in 1450. Unfortunately it was destroyed by fire in 1879, and the current building is almost entirely a 19th century affair. A remarkable and unusual medieval survival is Ware Hall House (NHER 13797), a medieval timber framed building, originally constructed in 1450 in Ware, Hertfordshire. In 1970 it was dismantled and transported piece by piece to Wells, where the owner spent the next twenty years reconstructing it. Ingledene, at 47 Freeman Street (NHER 23192) is a two storey flint and brick house with a pantile roof, dating to the late 18th or early 19th century. In fact on closer inspection, the building seems have, at least partly, much earlier origins. The rear range is a possibly mid 15th century timber framed building, with a chimney stack added in about 1600, and other alterations of about 1800. The front range is a heightening and refacing of an older building. The complex originally formed a courtyard, but the south and west ranges were demolished in the 1950s, leaving an L-shaped plan. Other medieval buildings have not survived. Just southwest of the town is the site of a medieval manor house (NHER 36034), though nothing can be seen today. Medeival finds include pottery fragments (NHER 1816, 18176, 14304, 18176 and 42562), a gaming piece (NHER 12930) and a candlestick (NHER 18985). At the last count there were a hundred and sixty five post medieval buildings of historical or architectural interest in the parish (the majority in the town itself), far too many to detail individually in this summary. A few selected examples can be given here, but those requiring more detailed information should consult the full records. A particular concentration of these buildings is to be found in the centre of the town at The Buttlands, a spacious green ringed by trees and Georgian houses. Well House (NHER 47436) on Standard Road is a complex 16th or early 17th century house, two storeys high with attics and subject to later alterations. The entrance is set back and has a small forecourt. Inside there are massive timber beams, early 17th century panelling and wide fireplaces of about 1700. The Golden Fleece Inn (NHER 11764) is a 17th century inn with 18th century additions and a cellar, altered in the 19th century. It has a massive and very good Jacobean staircase, though this was in poor condition when inspected. Between 1850 and 1880 there were some forty public houses in the town, but nearly all have now been converted to private houses. Blenheim House on Theatre Road (NHER 47406) formerly the home of a sea captain, is a 17th or early 18th century painted stucco house set out in a T-shaped plan. Inside, a winding staircase leads up to an attic look-out. The Old Customs House (NHER 47415) on East Quay is first mentioned in Samuel Pepys diary in 1666, and is an early 17th century flint, brick and stucco building, much altered, with a pantile roof. It is two storeys high with a decorated dormer attic window. There is a cast iron Royal Arms. The former Queens Warehouse is to the east and has a heavy door with an iron grilled square opening. The Lifeboat House (NHER 47433) on Beach Road is a single storey rectangular stone and white brick lifeboat house of 1869, in Gothic Revival style with a black glazed pantile roof and later additions and alterations. The north half is now a maritime museum. The south half was converted to a reading room and tea rooms in 1897 to celebrate Queen Victoria's Diamond Jubilee. St Nicholas’ Church (NHER 1851) referred to above is a vast, urban barn of a building, on the southern outskirts of the town. It is almost entirely Victorian, its medieval predecessor having been destroyed by fire in 1879 after being struck by lightning. It was rebuilt along its original 15th century lines, but the inside is solidly 19th century. The Library on Station Road (NHER 47446) is a stuccoed brick Wesleyan Chapel of 1759, seriously altered for its present purpose in 1949. The Friends’ Meeting House (NHER 47659) on Chapel Street is a brick and flint Quaker Meeting House of 1783 with a pantile roof and later alterations that include a 1913 extension. Other churches include The Congregational Church (NHER 47455) on Clubbs Lane, which is a red brick chapel of 1816 with an added porch, and the former Ranters’ Chapel (NHER 47657) adjoining 24 Chapel Yard, a red brick former chapel with a date stone of 1836. It has been converted to a garage, the original entrance being blocked and given double doors. A more recent building is Our Lady Star of the Sea (NHER 39340), a red brick and stone church of 1928 in the Arts and Crafts style with pantile roofs. The building consists of an aisled nave, transepts and a chancel and is a very fine example of a church of the period, little altered. The remains of the Wymondham to Wells Branch line (Great Eastern Railway) (NHER 13588) can be seen on aerial photographs. The section from Wells into the parish of Wighton was still in use in 1957, but today it forms part of the Wells to Walsingham Light Railway. The remains of the Great Eastern Railway Wells Harbour Line (NHER 13589) can be seen on RAF 1946 aerial photographs and on 1957 images. This runs from Wells junction to the quayside. It is no longer in use by the 1957 aerial photographs, but the route it took and the location of cuttings and embankments are clearly visible. It appears to still be in use on the early RAF aerial photographs. It is now used as a road. The remains of the West Norfolk Junction Railway (NHER 13590), later the Great Eastern railway, can be seen on aerial photographs and as a landscape feature. The railway was opened in 1866, and finally closed in 1964. The route of the railway and the location of bridges, cuttings and embankments are clearly visible on maps and aerial photographs. Several windmills (NHER 15204, 15205, 15206 and 36045) are known to have stood in the parish and are marked on late 18th and early 19th century maps. However, no trace of them remains today. The same goes for two brick kilns (NHER 15815 and 15816) and a lime kiln (NHER 16707). A maltings (NHER 41217) in Croft Yard, marked on a map of 1863, was demolished in 1983. Being a coastal parish, numerous sea defences (for example NHER 36863) and 36870), harbour walls and breakwaters (for example NHER 41483 and 41484) and quays (for example NHER 41491 and 41498) have been identified on the ground, from old maps and from aerial photographs. Many undated revetments (for example NHER 41478 and 41480) and post alignments (for example NHER 41479 and 41482) have also been noted along the area’s coast. Two type K6 glazed square cast iron telephone boxes, built to a 1935 design by Sir Giles Gilbert Scott, are listed in the parish, one in Freeman Street (NHER 47424), the other in The Buttlands (NHER 47423). The landscape of the parish changed dramatically during World War Two with the construction of a huge network of anti-invasion structures along the Norfolk coast. In Wells these included coastal gun batteries (NHER 32433), anti-tank mortar emplacements (NHER 32434), beach scaffolding (NHER 36846), anti-tank blocks (NHER 36858) and minefields (NHER 36860). The massive scale of these defences can be seen on contemporary aerial photographs, and though most of the structures were cleared away after the war, some can be seen today, including pillboxes (NHER 23977, 32437 and 36035) and anti-tank blocks (NHER 36042 and 41477). South of the town is the site of a Royal Observer Corps underground monitoring post (NHER 35433), in use from 1958 to 1968. It was part of a network of such posts, designed to monitor fallout in the event of a nuclear attack. Demolished after closure, no trace of it remains today. Piet Aldridge (NLA), 7 November 2006.